← What Would Jesus Say? This story appears in the Gospel of Matthew 19:16–30, the Gospel of Mark 10:17–31 and the Gospel of Luke 18:18–30. It is where we get the saying, “It is easier for a camel to go through the eye of a needle than for a rich man to enter the Kingdom of Heaven”. In other words, it is nearly impossible for the rich to enter heaven, regardless of whatever else they do. But why? Jesus said that the two most important commandments were to love God and to love your neighbor as yourself [Matthew 22:36-40]. Conspicuous wealth is perhaps one of the greatest indicators that you are not following the second commandment (and perhaps not the first, as the two are inextricably tied to one another). How can you possibly say you love your neighbor when you have more than enough to eat and he has nothing? Did you need that new iphone more than a starving child needed to eat this year? Did you need that new Lexus more than an entire village needed an untainted water supply? Probably not. The more personal possessions you have, the farther you have probably strayed from Christ’s most important teachings. Jesus taught the complete redistribution of wealth, at least on a personal level. 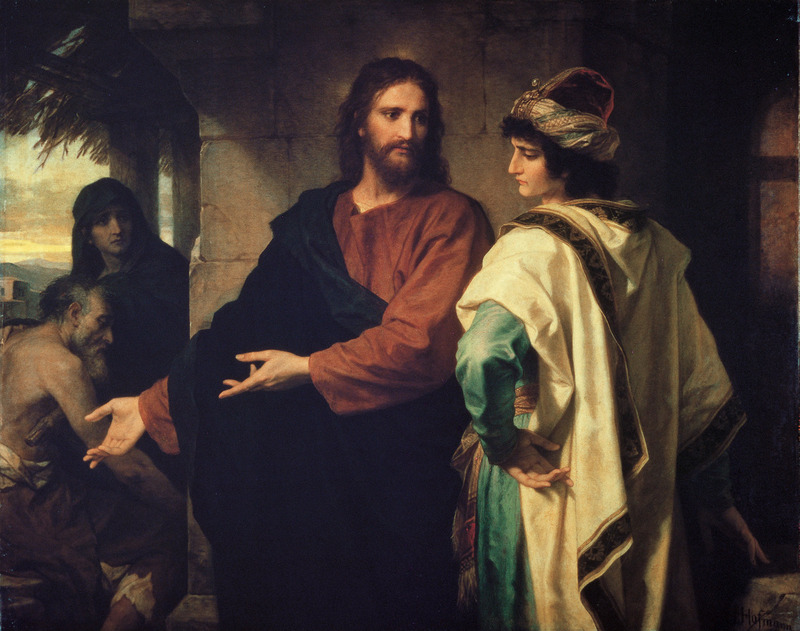 He did not merely suggest giving token amounts to the poor but as with the story of the rich young man, and the lesson of the widow’s mite [Mark 12:41-44, Luke 21:1-4] selling all of one’s possessions and giving it to the poor. The wealthier you are, presumably the harder it is to do. Personally, I think that perhaps the greatest and most common excuse for an overabundance of wealth might be, “I am just trying to provide a ‘comfortable’ lifestyle for my family”. Who doesn’t love their spouse or their children? But isn’t the best possible lifestyle and example you can provide for you family one that is inline with Christ’s teachings? But ultimately, who are the wealthy? I don’t feel like I’m wealthy at all. Yet, I have a car, a phone, a personal computer, a roof over my head and food in my refrigerator. To a staggering number of people worldwide, that is beyond their wildest dreams of wealth. In truth, I have a little more than I really need: eg. a TV set with a cable bill to boot. If I gave them up, not only could I help others with the proceeds, it would free up a little extra time to volunteer where I am needed. This entry was posted in Bible, Heaven, Jesus, Ponderings and tagged Christ, God, Jesus, Luke, Mark, Matthew. Bookmark the permalink.